There is a link to a biography of Sir Thomas Longmore with more information here - https://livesonline.rcseng.ac.uk/biogs/E002566b.htm . He was present at the signing of the Geneva conventions on more than one occasion. Sir Thomas Longmore, born 10th October 1816, died 30th September 1895, was the son of naval doctor Thomas Longmore and his wife Maria Elcum. He was a military doctor (19th Foot Regiment) in the Crimea during the war of 1853-1856. 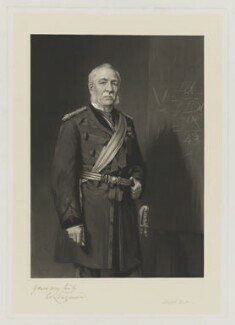 He later went on to become Inspector General of the British Army and Surgeon General, and ran the military hospital at Netley near Southampton. 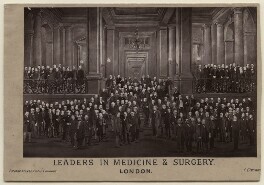 He wrote many booklets on medical subjects including ophthalmology, battlefield ambulances and the treatment of gunshot wounds. He married 11th February 1862 Mary Rosalie Helen Moorsom, daughter of Captain William Scarth Moorsom who was an army officer and an engineer. Sir Thomas Longmore was Knighted Order Of The Bath in 1867.